The latest trailer for Rockstar Games' Red Dead Redemption 2 teases a first-person mode, endless activities, and madness. It outlining all sorts of nefarious activities Arthur and the Van der Linde Gang can get involved in, including robbing trains, encountering rival gangs and outlaws, evading cunning lawmen and lots more in a world that is deep, teeming with life and very menacing. 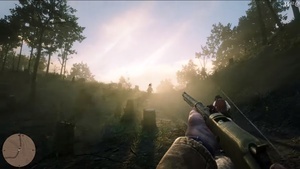 The trailer shows us more of the improved Dead Eye system that was so well received in the first Red Dead Redemption title eight years ago. Additionally, we get a nice tease of viewing the world in first-person mode for those who are fond of first-person shooters. Red Dead Redemption 2 will land on the Xbox One and PlayStation 4 console systems on October 26.